Trench warfare resulted in many casualties, mostly from enemy action but also from illness and injury. There was a system in place to handle these casualties starting with each forward unit’s regimental aid post (R.A.P.) operated by the unit’s Medical Officer (MO). From there, as necessary, casualties would be moved back through a series of stations where they were further assessed and treated. These included advanced dressing stations (A.D.S. ), casualty clearing stations (C.C.S.) and main dressing stations (M.D.S.). The handling of casualties from the R.A.P. back to the M.D.S. 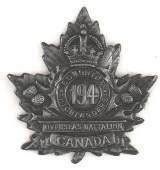 was the job of the Field Ambulance units, part of the Canadian Army Medical Corps (C.A.M.C.). During the summer of 1916 the 49th Battalion continued to fight in the Ypres sector of the front lines. In September the 3rd Canadian Division moved to the Flers-Courcelette sector in France and became part of the Battle of the Somme, a costly battle intended to relieve pressure on the French defenders of Verdun. While British, Australian and New Zealand forces battled the Italians and Germans in North Africa, the threat of an invasion of the British Isles still existed at the beginning of 1941. The Edmonton Regiment, in England for a year now, continued to train for their part in repelling the invasion should it come. Fourteen months after the start of the First World War, on October 9, 1915, the main body of the 49th Battalion, Canadian Expeditionary Force (CEF), with 30 officers and 890 other ranks, departed from Folkestone, England and arrived at Boulogne, France. Three days later they were 20 km behind the Ypres, Belgian, front lines. During the second quarter of 1916 the 49th Battalion fought in the Salient (bulge in the line) to the east of Ypres, Belgium. 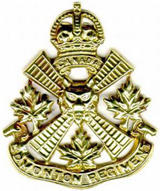 Together, with The Royal Canadian Regiment, Princess Patricia’s Canadian Light Infantry, and the 42nd Battalion (Royal Highlanders of Canada) from Montreal, they formed the 7th Canadian Infantry Brigade (CIB). Here they were under great pressure from the Germans who wanted to clear the salient and advance through Ypres. In the third quarter of 1915 the 49th Battalion was now in England and had begun further training in preparation for deployment to the front lines. There were still some doubts, however, that the battalion would stay intact and be deployed as a front line unit. Having just gone overseas with the 19th Alberta Dragoons Special Service Squadron in October 1914, Lieut. Colonel William (Billy) Griesbach arrived back in Edmonton on the morning of December 26 with orders from Ottawa to recruit and train a new battalion of infantry. The Second Battle of Ypres raged from April 22 to May 25, 1915 and elements of the first Canadian contingent to go overseas were involved. Edmonton area’s 19th Alberta Dragoons Special Service Squadron (19AD) was there when, on April 22, the Allies came under chlorine gas attack. In early January of 1916 the 3rd Canadian Division had joined the Canadian Corps in the Messines Ridge sector in Belgium. The division’s 7th Brigade, including the 49th Battalion, moved into line on the southern shoulder of the Ypres Salient around Kemmel. After two relatively uneventful months, the brigade moved, in late March 1916, to the salient itself. 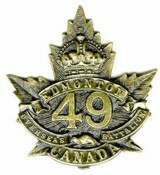 While the 49th Canadian Infantry Battalion (Edmonton Regiment) was deeply immersed in bitter trench fighting on the European continent in the second quarter of 1916, a new Edmonton battalion, the 194th (Highland) Canadian Overseas Infantry Battalion, unofficially named the Edmonton Highlanders, was being formed.